This png shows the datacard SD260 on a right angle with the input hopper open and the blank cards are in clear sight. Now your ID card issuance can be fast, efficient - and green. 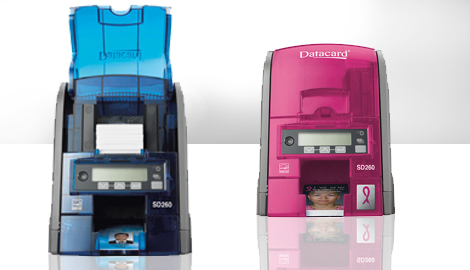 The SD260 is an ENERGY STAR® qualified printer, and in addition, biodegradable cores with EcoPure® additive and recyclable parts and packaging make it the industry's first environmentally friendly desktop card printer. New TrueMatch™ printing technology creates vibrant, crisp and clean credentials that are both secure and visually impressive. The SD260 printer lets you produce predictably outstanding images by emulating the sRGB industry standard colour space for improved colour management. There's no learning curve with the SD260 printer. The printer display panel automatically alerts users when supplies are running low. Installation and printer operations are easy to understand with the helpful documentation tools provided with the XPS Printer Driver installation. The browser-based printer manager makes it easy to control printer settings. Never worry about jamming again with TruePick™ card handling. You can save work time and increase productivity by experiencing the fastest print speed in its class. Good fast service and quick delivery. Staff are fantastic and very helpful. Many thank Lesar.